I love the wasabi I do. Bagsy a bar?!? OH, I won’t be able to eat it til Sunday though. Hah hah! Course you can have a bar. Oh wow that sounds excellent! Love the Kit Kat chunky’s and did a double take when I saw this!! Not a flavour I would have thought of but it does sound intriguing. Intriguing is the word, Tim! Hey Chris – they do taste weird but the novelty still hasn’t worn off! I have a Ginger beer flavour Kit Kat at my desk at the moment . 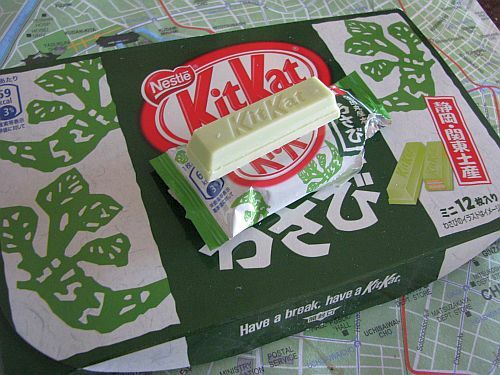 I bought it by mistake in Tokyo thinking the Kit Kat was green tea flavour. Anything with wasabi in it is fine by me. Hai Lucy – yeah, they’re totally weird! Hi Cacamillis – thanks for stopping by the blog! I think my sister may have mistaken these for Green Tea kit kats too. But to be honest, I’m kind of glad she did! They’re enchantingly odd.